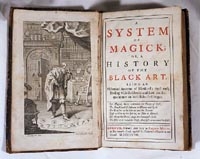 You are here: CollectionsOnline / A system of magick; or, a history of the black art. Being an historical account of mankind's most early dealing with the Devil; and how the acquaintance on both sides first begun. London, printed: and sold by Andrew Millar, 1728. Anonymous. By Daniel Defoe. The first edition was dated 1727 with the imprint of J. Roberts, but according to Moore was in fact published 24 November 1726. This is another issue of the sheets of the edition dated 1727 with a cancel title-page. One of a "curious group of books dealing in a half sceptical, half credulous and altogether gossiping, fashion with occult subjects" published by Defoe towards the end of his life (The Cambridge history of English and American literature, 1907–21, vol. 9, p. 40). The engraved frontispiece by Gerard van der Gucht (1696--1777) after an untraced artist named 'Eberlein' depicts a necromancer in his cell summoning spirits from the dead. Title-page printed in red and black. ESTC t70334; Furbank and Owens 233; Moore 487; Hooked on Books 6.2. Copy Notes Copy 1: Inscribed in ink on front free-endpaper John Soane / 1812. Bookseller's price 10s/6 inscribed in pencil inside front cover. Inscribed in ink on upper cover G JAC. Copy 2: Text-block cropped, affecting some page numbers. Inscribed in ink on the title-page, cropped at the top and fore-edges: Ralph Kelin[g]. Bound as part of a uniformly bound 48-volume set of works by or attributed to Defoe which on the evidence of endleaves variously watermarked '1814', '1808', etc. was presumably assembled around 1810--15. Binding Copy 1: C18th Cambridge-style calf blind-panelled calf, gilt-ruled spine, red morocco spine-label, spine-title reading 'Sistem / of / Magick'. Copy 2: C19th half calf, marbled-paper boards, gilt-tooled spine direct-lettered in gilt 'Defoe's Works' and 'A System Of Magick'.